Eric Day, a two time cancer survivor and the author of the book “Stay Positive,” joined Triton Elementary School Monday, Sept. 28, at the annual Trojan PRIDE kickoff. Eric explained to students how he uses and has used PRIDE to spread his “Stay Positive” message. Each student from Triton Elementary School received a “Stay Positive” wristband to remind us on a daily basis, no matter what life throws at us, we need to stay positive. We may not be able to control a lot of things but we were reminded by Eric that we can control our Attitude. 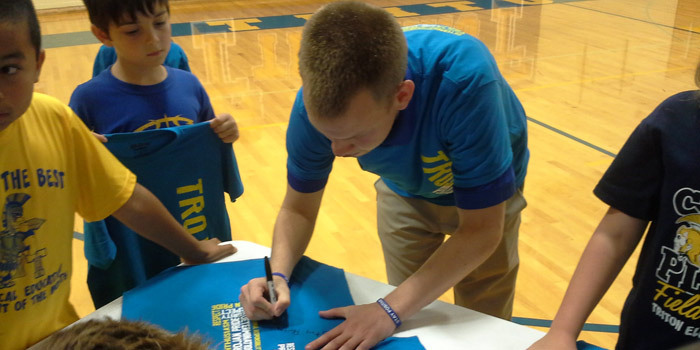 Eric, along with 28 well deserving students, received the newly unveiled Trojan PRIDE t-shirt. It was a great assembly and everyone learned a lot about how we can positively impact others with a smile and a great attitude. Thanks, Eric, and thanks Triton Elementary Students for showing your Trojan PRIDE to our guest!